President Moon visited Malaysia in 9 years after the last visit of the former president Lee. Moon and First Lady Kim were warmly greeted by Sultan Abdullah of Pahang and Mahathir Bin Mohamad, the Prime Minister. 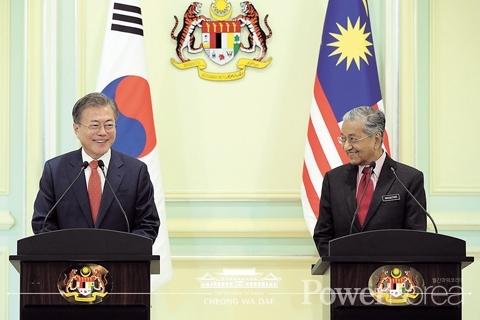 The two countries tied diplomatic relations in 1960 and the direct lines between Jeju Island and Kuala Lumpur and between Incheon and Johor Bahur prove its high level of cooperation and exchange. Around 610,000 Korean were estimated to have visited Malaysia last year while around 380,000 Malaysians to Korea. Mr. Mohamad said that he had been looking forward to meeting Moon and wished the summit would raise stronger bilateral relations than ever before. Moon in response praised the Look East Policy of Mr. Mohamad and he would raise the Korea-ASEAN relations to the level of that with the US, China, Japan and Russia through his New Southern Policy. 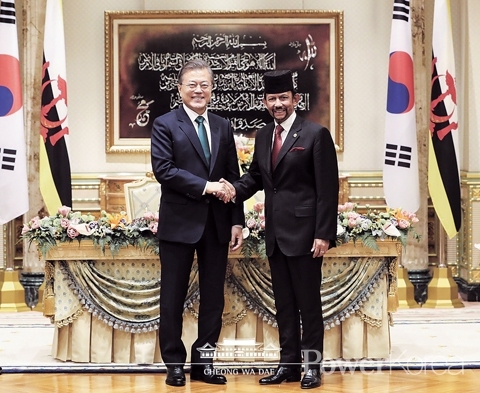 President Moon and Hassanal Bolkiah, Sultan of Brunei, discussed on bilateral relations, Korea-ASEAN cooperation and the situation on the Korean Peninsula at the summit. They signed a joint agreement consisted of 24 articles after the summit. “I’m really glad that Korean companies have taken part in building Ripas Bridge and Temburong Bridge that will be two symbols of your feat. I hope Koreans’ cutting edge technique, knowledge and experience will keep contributing to development of Brunei. I’m also glad that our cooperation is expanding to gas field development and selling and we will willingly make a bid when you call for bids of a long term LNG contract” said Moon. President Moon met Hun Sen, Prime Minister of Cambodia, and shared opinions on strengthening friendship, co-growth, Korea-ASEAN cooperation, and peace on the Korean Peninsula. “Since the diplomatic ties in 1997, the two countries have made a great advancement in cooperation. The trade volume reached near USD 1 billion and people exchange over 400,000 last year. It is also notable that about 50,000 Cambodians are living in Korea. Cambodia is the second largest development partner of Korea and an important partner of our New Southern Policy. I hope your national development plan and our New Southern Policy will create synergy effects on the way to co-growth and prosperity” said Moon. The two leaders signed 4 organizational agreements and 1 government agreement after the summit.